Big US companies have been binging on their own stock. But Warren Buffett's Berkshire Hathaway hasn't been taking part in the bonanza. That soon may change. Berkshire Hathaway (BRKB) announced late Tuesday that the company loosened an old company rule and can now buy back stock whenever Buffett and Berkshire Vice Chairman Charlie Munger "believe that the repurchase price is below Berkshire's intrinsic value, conservatively determined." In other words, Buffett and Munger can pretty much decide to buy stock whenever the heck they feel like it. Berkshire Hathaway stock had its best day in almost seven years after the change was announced. Stock buybacks have been one factor helping fuel the market run to record highs in 2018. Companies bought back $436.6 billion of their own stock in just the second quarter -- a new record, according to data from research firm TrimTabs. Companies have now repurchased nearly $670 billion of their own shares so far this year. Buybacks are considered a bullish sign for several reasons. For one, a company may be signaling it thinks its stock is a bargain. Buybacks also lower a company's overall share count, which in turn boosts earnings per share. But the last time that Berkshire -- an industrial empire that owns Geico, railroad Burlington Northern Santa Fe, Dairy Queen and numerous other businesses -- bought its own stock was in December 2012. One reason Berkshire has stayed on the sidelines of buybacks is because of the company's old rule, which stated that Berkshire could not pay more than 20% above Berkshire's book value per share -- a key measure of a company's financial health. As of the end of the first quarter, the book value for one class A Berkshire share (BRKA) was $211,184. But the price of one Berkshire A share currently trades for nearly $300,000. That's 40% higher than book value, which means Berkshire was prohibited from buying the stock under the old rule. Berkshire also has more affordable B shares that trade at a price of about $200. Shares of both the A and B classes of Berkshire stock rose more than 5% Wednesday, their best showing since September 2011. Whether or not Berkshire actually does buy back some of its own stock remains to be seen. The company said late Tuesday that it would not buy back any shares until after it reports its second quarter earnings following the market close on Friday August 3 -- at the earliest. 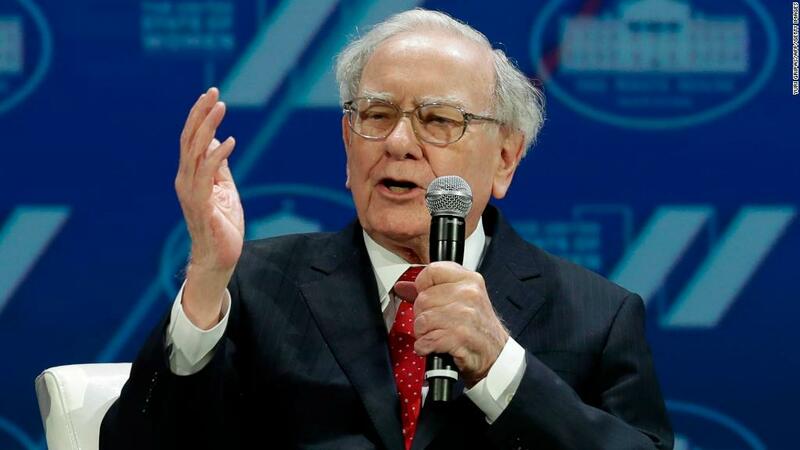 Berkshire also said would keep a rule that prohibits the company from buying back stock if the purchases reduce the amount of cash it has to below $20 billion. That shouldn't be a problem. Berkshire had more than $108 billion in cash and short-term Treasury holdings on its balance sheet as of the end of March. Berkshire, like many large American companies, has been hoarding money lately. The company had $96.5 billion in cash at the end of the first quarter of 2017. That's why some have been pushing Berkshire to use the cash on stock buybacks, investments and acquisitions. Its last major acquisition was the purchase of aerospace parts maker Precision Castparts for $37 billion in 2015. Berkshire-backed Kraft Heinz (KHC) tried to buy Unilever (UL) last year but walked away from the deal after Unilever decided it wasn't interested. Even though Berkshire hasn't done a buyback of its own in more than five years, many companies that Berkshire has invested in, including Apple (AAPL), Coca-Cola (KO) and IBM (IBM), have frequently repurchased shares during the past few years. Buffett has praised buybacks too. He defended the practice in last year's shareholder letter. "Some people have come close to calling [buybacks] un-American -- characterizing them as corporate misdeeds that divert funds needed for productive endeavors. That simply isn't the case: Both American corporations and private investors are today awash in funds looking to be sensibly deployed," he wrote. So don't be surprised if Berkshire -- which is clearly "awash in funds" -- soon decides to deploy some of them on a stock buyback.